Spelling – Page 2 – Grammargeddon! One October I made this a theme, because of that whole Halloween/devil/demon/hell thing. It’s not really seasonal at all, though. Homophone hell is ever present. Here’s the proof. But not. Anyway . . .
First up, in keeping with the theme of this blog, is my GUMmy Stuff. These are all about grammar, usage, and mechanics. Some of them are original content, some are links to other folks’ blogs, some are cartoons, but all are focused on GUMmy Stuff. Here you go. Don’t get stuck in there. It can be messy. Pursuant to a discussion with Google+ user Fiber Babble about proofreaders and grammar checkers, I looked into Ginger Page, a free grammar and spelling checker (and supposedly much more) that I heard about on Twitter. They’re “captive,” all right. This was on the back of the ladies’ room toilet stall door. 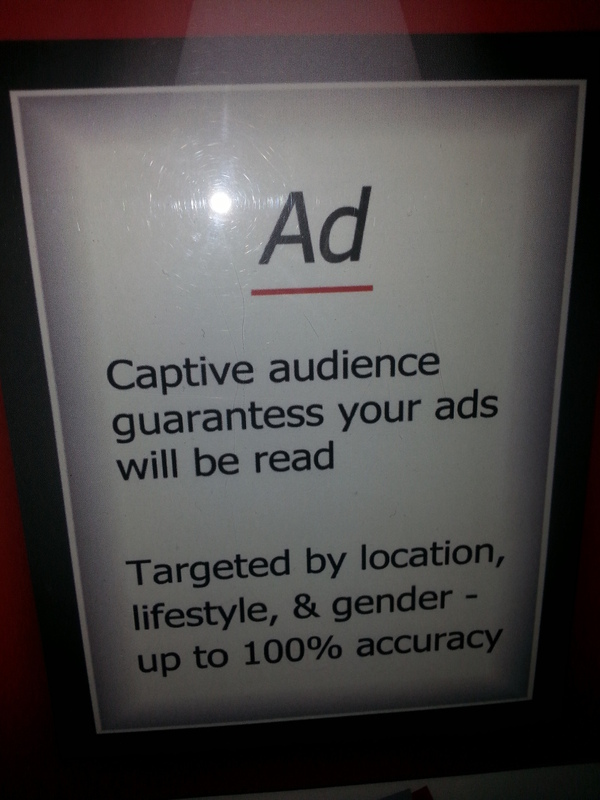 The agency this poster promotes promises a “captive audience” for your advertisement. It’s one of those that specializes in pre-show theater ads, you see. It does not, however, promise that all the words will be correctly spelled.